How does a leftist firebrand end up a Tea Party darling? The only film with access to Darby since his public confession, Informant meticulously constructs a picture of his life — before and after the death threats — through interviews and tense reenactments starring the man himself. Darby’s version of events is accompanied and often contradicted by evidence from acquaintances and expert commentators on various points along the political spectrum, posing complicated questions about trust and the nature of reality. all along the political spectrum." 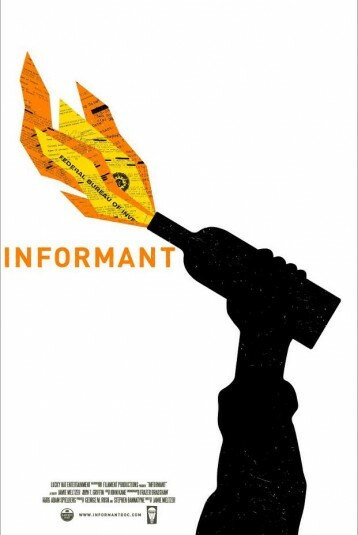 "Informant is… one of several [films] that ponder the limits and expand the possibilities of what documentaries can do." "Activist groups of all stripes will want to see it, but the force of Darby’s personality —a rich stew of righteousness, arrogance and self-delusion — gives the doc a psychological appeal independent of politics."